Tomas Sholl is quickly rebounding from a difficult first season at Bowling Green. 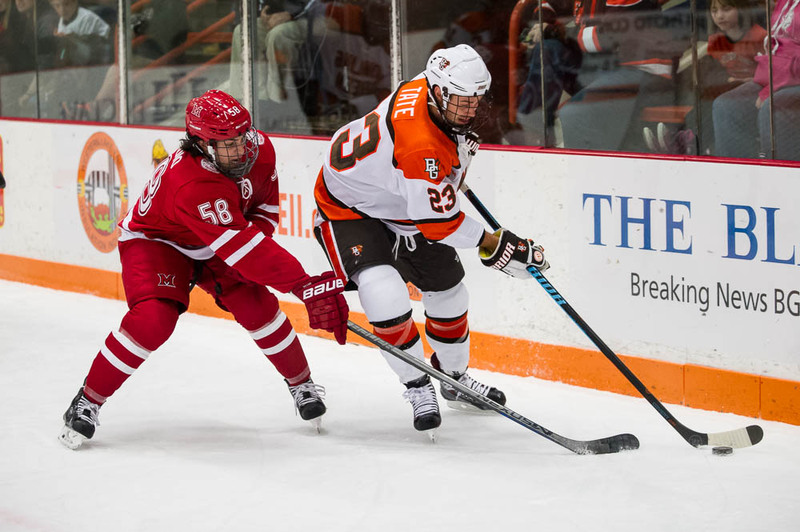 The sophomore stopped 22 shots to lead the Falcons to a 3-2 win over 10th-ranked Miami in the Ice Arena. Sholl played well from start to finish, but was exceptionally sharp during the second period when he made 11 stops. The Falcons built a 2-0 lead during the first 28 minutes, but Miami stormed back. Miami dominated the final 13 minutes of the period, but Sholl’s goaltending allowed BG to retain a 2-1 lead. 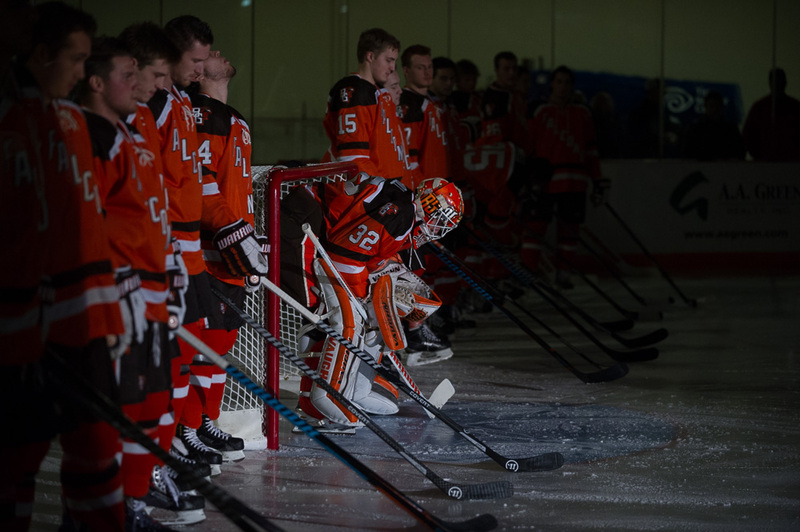 Sholl added four saves in the third period as BG held on to win its season-opener. Sholl’s final save in the second period was a stop with his left pad on a 4-on-2 rush. That came moments after BG defenseman Nolan Valleau blocked Miami’s pass on a 3-on-1 rush. Sholl came to BG as the heir apparent to former standout Andrew Hammond, but didn’t play consistently well. The Hermosa Beach (Calif.) native was solid during the first half of the season, but didn’t fare as well during the second half. Tommy Burke started BG’s final 10 games in goal after splitting the first half of the season with Sholl. Sholl is battling Burke and freshman Chris Nell for No. 1 position in goal. Burke will start Sunday’s series finale at Miami and Nell is expected to start a game at Alabama-Huntsville Oct. 17-18. Sholl faced just two shots in 20 minutes during last weekend’s exhibition against Simon Fraser, but was frequently tested by Miami. The RedHawks also put heavy traffic around the crease, forcing Sholl to make saves in traffic and do a good job of controlling his rebounds. He also covered the puck at key times to earn the Falcons a stop in play when they were under pressure. “There were times last year where it almost seemed he was OK not playing in the second half, and we told him he didn’t come here to watch,” Bergeron said. “I’m not taking anything away from Tommy Burke. CLOSE CALLS: The Falcons had trouble holding leads last season, going only 16-6-2 when leading after two periods and 1-3-3 when being tied after two periods. Even though Miami closed to within 3-2 with 7:45 left in the game, BG didn’t fold. After Miami made it a one-goal game with less than eight minutes left, BG played well the rest of the way and was solid defensively during the final 93 seconds after Miami pulled goalie Ryan McKay for the sixth attacker. The Falcons held a 12-5 edge in shots during the third period. HOME ICE: Helped by an enthusiastic crowd of 2,118 in the Ice Arena, the Falcons came out and played a strong first period. Power-play goals from Kevin Dufour at 1:55 of the first period and Brent Tate at 7:43 of the second period gave BG a 2-0 lead. BG had 16 shots in the first period, to just seven for Miami. The Falcons held the edge in play by controlling the puck, forechecking effectively and playing the game in the offensive zone. But in the second period, the Falcons had too many turnovers and the game quickly became an end-to-end contest. SPECIAL TEAMS: The Falcon power play remained effective going 2 for 6, after going 1 for 5 in the non-counting exhibition against SFU. Tate’s goal came with a 4 on 3 advantage. Both BG power-play units are generating scoring chances. Miami’s power play was 0-of-2. The game had 10 penalties, all minors. Miami had seven penalties. NOT YET: Valleau, a freshman, thought he had his first career goal, only to lose it thanks it to video replay during the second intermission. Tate eventually was credited with the goal. Valleau shot from the center point., but the puck went in off Tate. Brandon Hawkins started the play by winning a faceoff in Miami’s defensive zone. DEPTH: The Falcons rotated four forward lines and six defensemen during most of the game, just as they did against Simon Fraser. And every player is capable of contributing — no longer do the Falcons have to hold their breath when certain forward lines or defense pairs are on the ice. “Everybody is contributing. We don’t have to rely on one or two players,” Dufour said. BALANCE: Nine players have scored goals for BG in the exhibition and the Miami game. Dufour is the only player with two. Dan DeSalvo and Adam Berkle — the Falcons’ top two forwards — didn’t have a point against Miami, despite having six shots. Linemate Tate added five shots. The three weren’t on the ice for either Miami goal. RECRUIT: Ryan Bednard, a goalie for the Johnstown Tomahawks in the North American (Junior) Hockey League, has verbally committed to BG. He’ll join for the Falcons for 2017-18 season and is the second goalie on the roster for that season. The other is freshman Chris Nell. Bednard had a 1.62 goals-against and a .939 save for the Victory Honda U16s last season. The 6-foot-4, 179-pounder will turn 18 in March. His brother, Shane, had previous committed to the Falcons and will be a freshman forward next season. Shane Bednard had 19 goals and 32 assists in 60 games at Johnstown last season. He’s playing for Bloomington in the United States (Junior) Hockey League this season. Bloomington’s head coach is former Falcon head coach Dennis Williams, who also is a former player and assistant coach at BG. HONORED: Former Falcon defenseman John Mavity, who died of cancer in January, 2013, was one of nine Canadian firefighters honored in Ottawa, Ontario recently. The firefighters were honored for dying in the line of duty or the result of their work in the last year. Mavity was a lieutenant in the Stratford (Ontario) Fire Department. 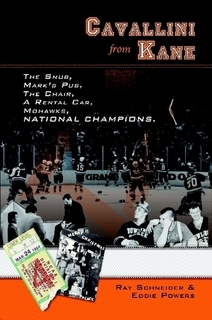 Mavity played at BG from 1974-78, earning first-team All-Central Collegiate Hockey Association honors in 1976-77. He later became a linesman in the CCHA.